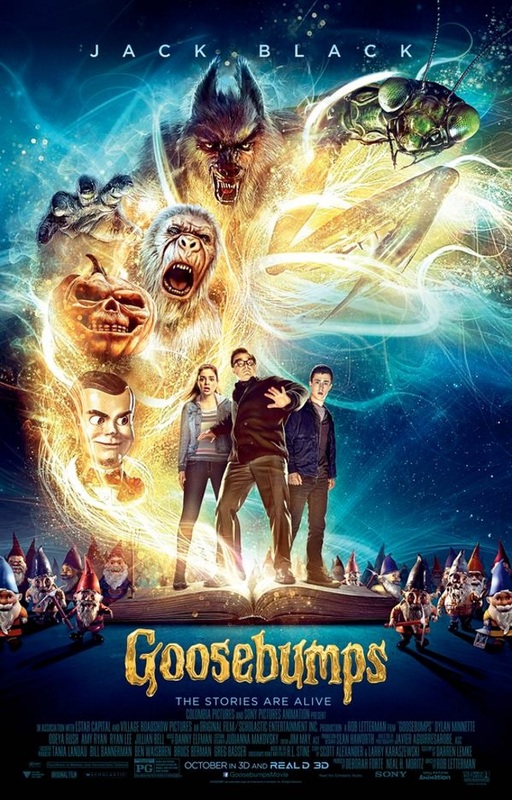 Goosebumps is exactly what it proposes to be. That is not an entirely good thing, but it is hard to fault the film for it. A film based on a series of somewhat spooky children’s books was never going to be more than a children’s movie. Goosebumps goes strongly for humor rather than horror, but it is otherwise cashes in mostly on nostalgia for those old books. Instead of adapting any of the dozens of books in the series, the Goosebumps movie is about the books themselves. That allows it to feature many of the monsters that have appeared in the series at the same time. It stars Dylan Minette as Zach Cooper, who moves from New York City to Delaware. Living next door is the enchanting Hannah, played by Odeya Rush, and her reclusive and abrasive father played by Jack Black. When Zach and his new friend Champ suspect something has happened to , they break into the house, avoid the bear traps in the basement and find that his neighbor is actually RL Stine, famous author of the Goosebumps series. Then they open a locked manuscript and free The Abominable Snowman of Pasadena. Your enjoyment of Goosebumps comes down to three things. The first, and least important because most of it is self-explanatory, is a familiarity with the series. There are numerous references that fans of the series, even if you haven’t read the books since you were in grade school, should pick up on. The next is a tolerance for CG tomfoolery. The CG is reasonably well done; though it never really fools the viewer into thinking any of it is real. The giant insect, Sasquatch and werewolf all look similarly fake, but they share an aesthetic that makes it seem deliberately a little cartoony and not a failure to look realistic. There are some fun shots, but it is all pretty cheesy. Lastly is how much enjoyment do you get out seeing Jack Black mugging and talking in funny voices? Because that is a big source of this film’s humor. As a big fan of Black who grew up reading Goosebumps books, this mostly works for me. The target audience is parents who read the books and their kids and this movie is likely to satisfy them.